New Delhi: India’s main opposition Congress party released its election manifesto on Tuesday, vowing among a slew of promises to halve unemployment in five years, bring a separate budget for farmers and change a law on special powers for troops in disputed Kashmir. 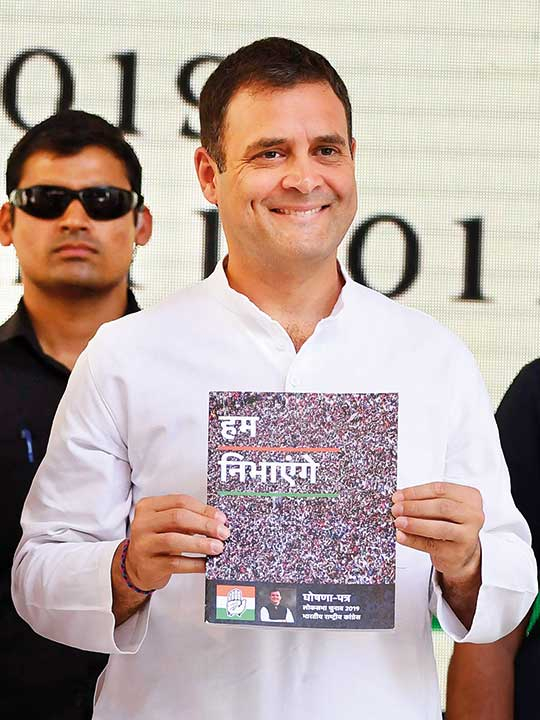 The manifesto was released by Congress party president Rahul Gandhi days ahead of a multiphase general election that begins April 11. The 48-year-old grandson of former Prime Minister Indira Gandhi blasted the ruling Hindu nationalist Bharatiya Janata Party (BJP) for working “to divide the nation and spread hatred” in a speech Tuesday in New Delhi outlining the manifesto. What is the main theme? 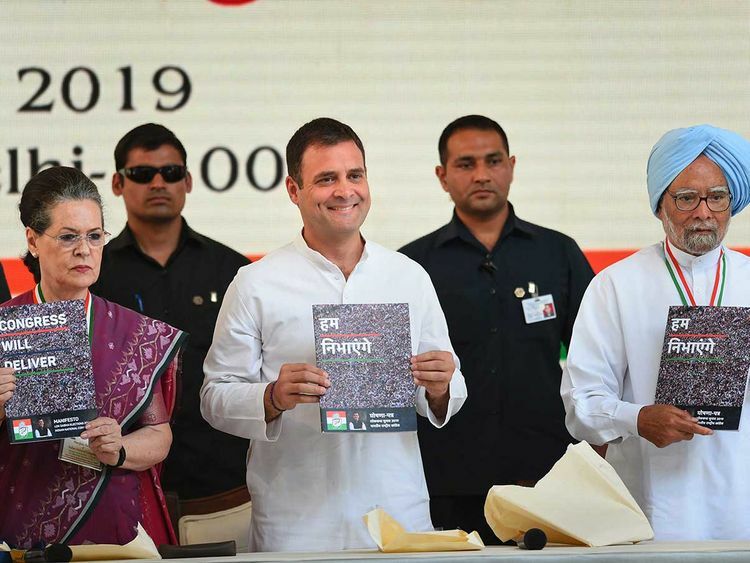 In a grand show in the capital, the party released the 55-page document titled “We Will Deliver” focused on addressing the issues of joblessness, farm distress, safety of women and boosting the rural economy. Gandhi said Congress would expand an existing jobs programme to guarantee 150 days of work a year to rural households, up from 100 days. “The main issues in the country today are unemployment and farmer distress,” he said. “Jobs, farm distress and a stagnant economy is what we are stuck in and see all around us. Our focus will be to first work on these and get the economic engines started. They are rusted at the moment. We need to give a shock-therapy to jump-start the economy,” he said. What are the other promises? Gandhi said that by giving money directly into people’s accounts, the Congress government will aid better spending and give definite impetus to Indian economy. What is the minimum income programme? “The narrative is clear — if PM Narendra Modi can give Rs30,000 crore to people like Anil Ambani, then Congress can ensure that we can and will put in money under the ‘Nyuntam Aay Yojana’ (NYAY) or a minimum income scheme directly into the accounts of the famers and poor,” Gandhi said. Singh said that if the thrust of Congress’ 2014 manifesto was on economic growth, the 2019 manifesto directly aimed at exploiting the economic unrest in the country. Gandhi said Congress had won voters’ hearts with last week’s plan to hand Rs 72,000 ($1,041) a year to India’s poorest, a promise the BJP has dismissed as a bluff and some economists have called fiscally irresponsible. What do analysts think of the manifesto? “Congress has promised farmers that they would not be sent to jail for non-payment of loans. This does not really address the issue; in fact, it sends a wrong signal to the farmers many of whom would be encouraged to borrow with intent to default. Not all farmers need help and the question is — those who indeed require help, will they get it or is it all misplaced assistance,” Negi told Gulf News. What is the main skepticism around such manifestos? Political commentator Ramesh Gupta said the manifesto failed to deliver on account of creating a balance between agricultural and industrial sectors. “Many arm-chair critics are praising the manifesto released by Congress today. What they do not realise is that India needs both agriculture and industry to compliment growth of each other. On that account, frankly no party or government has delivered yet… The BJP is failing to learn from it,” Gupta said. How did ordinary people react to the manifesto? “Congress leader P Chidambaram today said the thread that binds our manifesto is wealth and welfare of the people. But with schemes announcing mindless disbursement of money to people, it can’t be said to be a wise manifesto. It will only amount to wasting the money of the tax payer,” software engineer Himangi Tripathi told Gulf News.